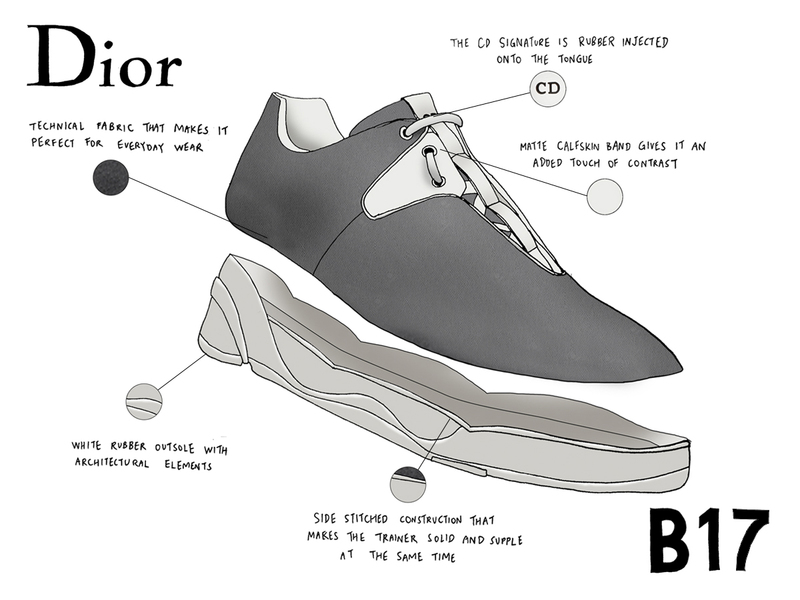 Because we all know of someone who’s constantly on the fence about choosing a sneaker that isn’t entirely a classic (B01) nor overly sporty (B21) and very much prefer a neutral in-between piece, Dior’s B17 Trainer in grey technical canvas would be the pair that’s got him covered. Coming in a perfect juxtaposition of two contrasting materials (a canvas upper and a rubber outsole), the B17 Trainer is one sneaker that’s the best of both worlds. Starting with the technical fabric (canvas, if you prefer) upper which makes it perfect for everyday wear without looking overly formal, the trainer is amped up further with elements like a matte calfskin band in the middle which gives it the luxe touch it needs, while the signature rubber band ‘interlaced’ into the shoe tongue gives it that sporty vibe. Over on the sole, that’s where the B17 Trainer gets truly interesting. Dior’s signature rubber outsole is given architectural elements which provide a beautiful visual contrast as opposed to the relatively clean upper.